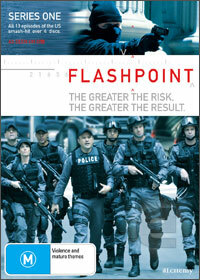 Flashpoint is the latest in a long line of crime procedurals in the vein of Law and Order, CSI and so on. So what’s the difference with this one? What sets it apart that makes it worth watching? Well for starters it’s Canadian, but don’t hold that against it. It looks just as good if not better than all the US procedurals clogging up the airwaves at the moment. It also stars the charismatic Enrico Colantoni as the lead. Fans of excellent TV might remember him from Veronica Mars, other fans might remember him from Just Shoot Me, either way Colantoni is a solid, believable actor. Twenty-somethings may also recognise Amy Jo Johnson, who will have no doubt haunted their pre pubescent fantasies as the pink Power Ranger. Flashpoint also doesn’t deal with investigations into crimes, it deals with responses to dangerous situations, which creates dramatic intensity. Has Flashpoint got your attention yet? If so do read on. For those sceptical of procedurals as a whole this will do little to convince you that it does anything radically different. Read on anyway though, as Flashpoint is a rather interesting show. Flashpoint concerns itself with the Strategic Response Unit, which is sort of like a SWAT team, except with a focus on negotiation instead of suspect takedown. This means that they are called in for all sorts of dangerous hostage situations where one wrong move could lead to a lot of bloodshed and tears. Colantoni is the leader of the gang, a cool, intelligent man who wrote the book (literally) on hostile negotiation. Hugh Dillon plays a sniper and grizzled veteran of the team, who struggles with his occasional use of lethal force. Johnson plays another sniper and the squad is rounded out by a bomb disposal expert, two non lethal weapons specialists and a soldier that is now a rookie with the elite unit. Every episode follows a fairly specific formula. It begins with a potentially dangerous situation, that heightens to the point where it flashes back and the viewer sees the events leading up to the potential carnage. This formula is followed rigidly every episode, which can grate as it gives an air of predictability to every episode. The episodes also give a small insight into the personal lives of each of the SRU members. Marriage issues, separation from children, and the stress of the job are all issues dealt with by the crew, and it helps make things a little more relatable. It also helps make the situations a little more real, as the members of the SRU aren’t just faceless wisecrackers, they are real people. Of course the main focus of the episodes are the situations themselves. As with all procedurals, the interest of these situations makes or breaks the interest of the episode. Seeing as the SRU deals with issues like hostage negotiation and bomb threats, most are pretty tense and interesting. However some of the cases are just not as immersive as the others which means that the episodes themselves suffer. Some of the standouts are the pilot, where Dillon has to deal with the effects of using lethal force on a suspect, the following episode where a father holds up a hospital to secure a transplant for his daughter, and the episode where a former security chief robs a bank so he can take care of his wife with Alzheimer’s. The best episodes are the ones where the situation is interesting and the characters are relatable. The people committing the crimes aren’t clear cut bad guys, they are usually normal people who have been put under extreme duress. This works well as it means the viewer forges an emotional connection on both sides, and can often see why the culprit is doing what they are doing. Flashpoint season one contains all thirteen episodes from the first series. The set comes with no special features, which is a shame as there could have been the opportunity for some interesting features on the look of the show and the basis of the cases. At the end of the day, Flashpoint is just another procedural, and Keith Mars and the Pink Power Ranger aren’t doing anything to change that. However it is a well written, well acted and incredibly slick looking television show. The cases are often gripping and relatable on both sides, and the small window into the personal lives of the crew give the viewer something to keep coming back to. It is never going to be mind blowing television, but it is a solid cop show to add to the long list of similar shows.